When it comes to deposit methods for online roulette websites, any Canadian player making their first real cash deposit will prefer to use a method with which they are already familiar. For this reason, roulette casinos accepting MasterCard are popular with first-time players from across Canada. However there are a couple of differences when it comes to making online gambling deposits using MasterCard, as opposed to using this particular banking method in the wider world of e-commerce. Here at Roulette.ca we explain it all so Canadian roulette players are not taken by surprise when making their first roulette MasterCard deposit. Roulette sites accepting MasterCard are easy to identify, as the familiar logo will be visible on the casino's homepage as well as in the cashier. Head over to the cashier or banking page to make a real money deposit to play roulette, MasterCard at the ready, then just click the logo and enter your card details and deposit amount. Unlike some other deposit methods, MasterCard deposits will let you start playing as soon as the transaction is processed, without a potentially lengthy process of waiting for funds to clear. So if you don't want to wait too long to play online roulette, MasterCard might be the deposit method for you. You may already have one: Unlike other deposit methods, many Canadians already have a MasterCard and use it for all sorts of payments and purchases over the internet. Instantaneousness: Once you make a deposit the money will hit your account pretty much straight away, making roulette MasterCard deposits ideal for a lot of players. Only enter your details once: After making your first deposit with one of the many roulette sites accepting MasterCard, your card details are stored safely and securely, making deposit number two even smoother. When making deposits for online roulette, MasterCard may be subject to checks, which aren't always commonplace for general online transactions, even those using the same banking method. Be aware that this is done with Canadian players' safety and security in mind, to minimise the risk of fraud, which unfortunately has been a hazard of online casino transactions in the past. The most common difference is increased responsibility to prove that you are indeed the cardholder, which, when you think about it, should be taken as a good sign that things are secure. This means you may be required to provide the online casino site with additional personal information, such as a separate ID document (e.g. a scan of your passport), while in many cases you will be required to scan both sides of your card to help ensure the deposit is genuinely coming from the card holder. When it comes to online roulette, MasterCard deposits aren't the be all and end all, and it can be worth your while to be selective about where you play. Just because you find an online roulette casino accepting MasterCard doesn't mean it will be a great place to play, and this is true for a number of reasons such as security of deposits and variety of games on offer, as well as something as simple as just the look and feel of a site. In the eyes of our experienced team of reviewers, who know everything there is to know about online roulette, MasterCard deposit is just one part of the ideal internet casino. They have found the best and most trusted roulette casinos accepting MasterCard and other popular banking methods, with freedom of choice for anyone who wants to play a wide selection of online roulette variations on any number of different devices. Credit cards continue to be the most versatile of all deposit methods. Often times, people get into a sticky wicket when trying to use them at online casinos. The reason some Canadians may run into a snag when attempting to use MasterCard is due to security concerns. In order to protect all parties from fraud, there may be some security checks run by MasterCard to rule out suspicious activity. Should this happen, you may have to take a few extra steps to ensure that it is really you and really your card. This shouldn't stop you from using your MC - rather, take comfort in knowing that all involved have your back. Does MasterCard allow online casino use? Yes, MasterCard allows for online casino use for Canadian players. But there may be times that additional security needs to be run in order to prevent fraudulent activity. This is actually a good thing and completely understandable. Is it a safe form of payment? It is one of the safest forms of online payment, and highly regarded. Because of added security checks at times, and implementation of the most secure technology, it is considered very safe. How fast are the deposits & withdrawals? Deposits are often times immediate. The only time it wouldn't be instantaneous would be if a special security check needed to be done, which does not happen often. Withdrawing is very fast and easy, typically completed in minutes. There are no additional fees added onto the player for depositing or withdrawing. In reality, most casinos absorb any fees associated with using credit cards for input/output transactions. Keep in mind, though, that depending upon your particular credit and account, you may be charged monthly user fees or interest rates. But that is not directly associated with online gambling. 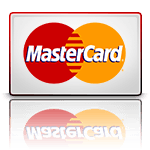 MasterCard is one of the most trusted forms of credit cards and online payments available today. MC has been around for many decades, and next to Visa it is the most popular form of credit card available to consumers.